If this lens pans out (i.e. has professional-level image quality) it will be quite a boon to stereo photographers. The Loreo suffers from too many disadvantages for serious pro use. Limited field of view (focal length not wide enough), small aperture, plastic lenses instead of optical glass, and no ability to adjust focus. Using a single camera (i.e. single sensor and shutter) takes a lot of the hassle out of shooting in 3D – no worrying about synching the shutter, exposure, and focus. I use a dual-camera rig and I can testify that these are huge hassles, especially when dealing with a non-static scene. The disadvantage being, as Bloody pointed out, that you cut in half the effective resolution and are forced to live with a narrow (portrait-type) aspect ratio. I will personally be happy that the lenses are relatively close together. Hypostereo (where the lenses are closer together than the average human eye spacing) is a vital tool in a stereographer’s arsenal. It is absolutely essential for both macro and close-up work (really, anything within six feet or so). So if you want to photograph a plate of food right in front of you, or a human being sitting across from you, that is the way to go. Portrait work as well. Group/crowd shots or landscapes, on the other hand, benefit from larger inter-axial lens distances. 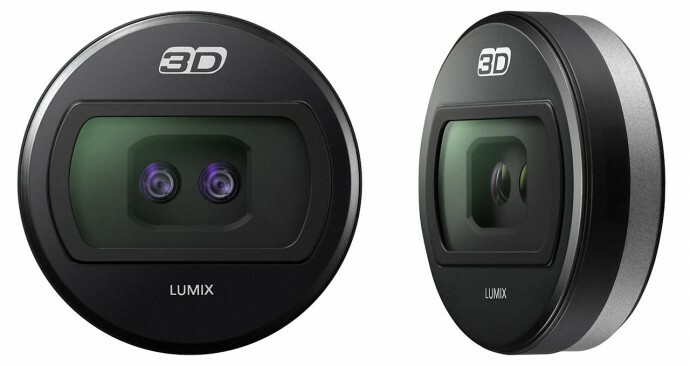 Also, I would note that this lens would make the Panasonic camcorder (mentioned earlier on this blog) redundant, as all of the newer micro 4/3rds cameras have video capability, and are capable of higher image quality due to the larger sensor sizes. The lens spacing also looks identical from the pictures. Apart form the small inter-occular these also have very small apertures and so will have a large depth of field. This gives bad stereo perception if objects behind the convergence plane are also in focus. It will be good for very close-up 3D, and typical use for a camcorder is baby pictures, but it’s not going to do landscapes. Most still-photo stereographers push for wider depth of field, actually, so that everything is in focus. Film (movie) and video stereographers are a little bit more likely to use somewhat narrower depth of field.